White paper on crime 2001 Part4/Chap.2/1. 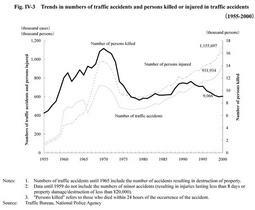 The numbers of traffic accidents and persons injured in traffic accidents increased enormously after the war, took a temporal downward trend between 1970 and 1971, before going on an upward turn in 1978. In 2000, the number of traffic accidents increased by 81,571 (9.6%) to 931,934, and the number of persons injured increased by 105,300 (10.0%) to 1,155,697 from the previous year, both of which were postwar highs, as in the previous year. In contrast, the number of persons killed in traffic accidents has been decreasing since 1993. In 2000, however, the figure was 9,066, an increase of 60 from the previous year.